How do I care for my acrylic painting? Keep your painting at room temperature. Extreme cold or heat can damage your artwork. Use a delicate brush to gently remove surface dirt from your painting. Be careful not to bump or scratch the painting. If you need to clean your artwork, use a professional cleaning service that has a good reputation in cleaning fine art. How do I prepare my painting to hang? All Liz W original paintings ship ready to hang with secured hanging wire so every painting hangs flat against the wall. What is the difference between original paintings, canvas prints and poster prints? All Liz W paintings are original hand painted on canvas. Acrylic paint and other mediums are used to add texture and dimensional interest. Canvas and poster prints, also know as giclee, are the result of images printed on canvas or high quality archival photo paper and have no texture or brush strokes. What is the difference between gloss and matte varnish? Gloss varnish tends to richen the colors and has the highest reflectivity. Matte varnish has no sheen, creates less glare, and colors tend to be dull. Gloss varnish is used on all Liz W original paintings. Are the borders of the canvas painted? All sides of Liz W paintings are painted so no frame is necessary. Depending on the artwork the painting may continue on the sides of the canvas or the borders are painted with a solid color. Will the colors match what I see on my monitor? Photos are taken with a high resolution digital camera to ensure accuracy. However, colors vary from monitor to monitor. What is the difference between stretched canvas and unstretched canvas? Stretched canvas is where the canvas wraps around the sides, stretcher bar or strainer bars, and a decorative frame is not needed. Unstretched Canvas is where the stretcher bar or strainer bars are missing and the artwork needs to be either stretched or framed in order to be hung. All Liz W paintings are stretched on gallery wrapped canvas ready to be hung. What is gallery wrapped canvas? Gallery wrap is a method of stretching an artist’s canvas so that the canvas wraps around the sides of the stretcher bar or strainer bars and is secured to the back of the wooden frame. All Liz W paintings are stretched on gallery wrapped canvas ready to be hung. Where can I read testimonials? You can read customers testimonials on the testimonials page. Are there staples on the side or the back of the canvas? All Liz W paintings contain staples on the back of the frame (not visible on the borders of the painting) to stretch the canvas securely in place. The borders of the canvas are painted so a decorative frame is not needed, however if you prefer you can have it framed. Can I refund or cancel my order? Yes, you must alert Liz W of a refund or cancellation request within 2 hours of submitting your order. Any refund or cancellation requests made after 2 hours will not be processed as the art will have already been packaged and shipped out. Can you make a custom painting for me? Yes, Liz W accepts commissions for custom paintings on a first come basis. Liz W will personally go over your content of choice and help you choose the best design of the subject and size of the art. Liz W works with you every step of the way to ensure you are absolutely satisfied with your commissioned artwork. Prior to finalizing, Liz W will review the artwork with you for any final changes if needed. The price of a commissioned piece is based on the process above, as well as taking into account the complexity and size of the art. A 50% deposit is initially required in order to begin customized artwork. Liz W reserves the right to create or not create a piece of art based on availability of material, subject matter, errors during transaction processing, etc. In case the artwork cannot be created, a refund will be issued immediately. Feel free to contact Liz if you are interested in creating a custom artwork! How will my art be packaged for shipping? All Liz W artwork is professionally packaged with bubble wrap and foam sheets where necessary. The artwork is then placed inside a double-wall corrugated box for added security. Fragile stickers are placed on the outside of the box. All artwork will be shipped via mail carrier of Liz W’s choice to ensure safe arrival. 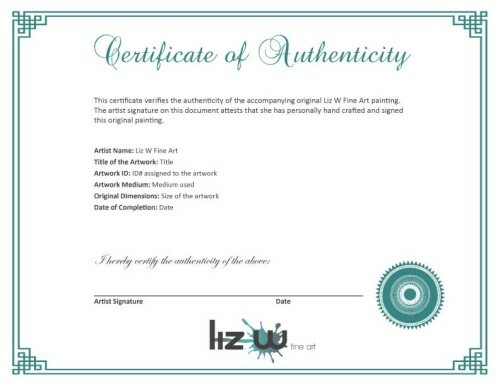 An Invoice and Certificate of Authenticity are included with every piece of art stating the details of the purchase. Upon receiving final payment your order will immediately be professionally packaged and shipped to your destination of choice for a speedy and safe arrival. Do you include a Certificate of Authenticity? If you have any additional questions that are not covered here, please feel free to contact Liz who will happily assist you!